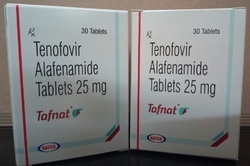 Pioneers in the industry, we offer tafnat tablet, hepbest tenofovir tablet, tafero 25mg, cronivir 0.5mg, ricovir tablets and durataf 25mg tablet from India. Headache, tiredness, dizziness, or cough may occur. If any of these effects last or get worse, tell your doctor or pharmacist promptly. Before using this medication, tell your doctor or pharmacist your medical history, especially of: kidney problems, HIV infection, other liver problems (such as hepatitis C, cirrhosis), bone problems (such as bone disease, bone loss/osteoporosis, weak/broken bones), disease of the pancreas (pancreatitis). Cronivir Tablet is used for Compensated or decompensated liver disease, Liver disease, Liver infection, Hiv patients infected with hepatitis b virus and other conditions. 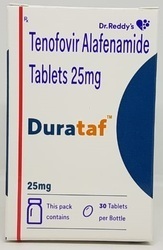 Cronivir Tablet may also be used for purposes not listed in this medication guide. 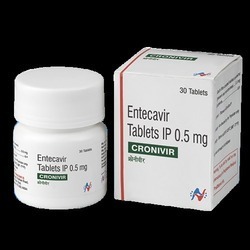 Cronivir Tablet contains Entecavir as an active ingredient. Cronivir Tablet works by inhibiting the activity of virus. Hetero Drugs manufactures Cronivir Tablet. Before using Cronivir Tablet, inform your doctor about your current list of medications, over the counter products (e.g. vitamins, herbal supplements, etc. ), allergies, pre-existing diseases, and current health conditions (e.g. pregnancy, upcoming surgery, etc.). Some health conditions may make you more susceptible to the side-effects of the drug. Take as directed by your doctor or follow the direction printed on the product insert. Dosage is based on your condition. Tell your doctor if your condition persists or worsens. Ricovir 300 mg Tablet is used in the treatment of HIV infection and chronic hepatitis B virus (HBV) infection. 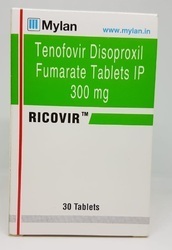 Ricovir 300 mg Tablet is an antiviral medication. It prevents the multiplication of virus in human cells. This stops the virus from producing new viruses and clears up your infection. Take this medicine in the dose and duration as advised by your doctor. Swallow it as a whole. Do not chew, crush or break it. Ricovir 300 mg Tablet is to be taken with food. 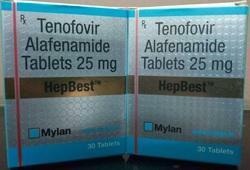 Looking for Hepatitis B Drugs ?